Sarah Jo Ritchie hails from a small town on the south side of Chicago and has been active in the EDS community since her diagnosis eight years ago. Sarah’s passion for reaching out and helping others began at a young age. Growing up with a younger brother with autism showed her very early on that many people treat those with disabilities completely different. Sarah became her brother’s greatest advocate, talking to and educating those around them about autism. After her diagnosis with Hypermobile EDS, the transition to becoming an EDS advocate came naturally. Sarah attended Loyola University Chicago as a nursing major. After many medical complications and finally her EDS diagnosis, Sarah had to leave the nursing degree; she finished her time at Loyola pursuing a psychology degree. Her passion for helping others included a ten-year stint with a comedy and improv troupe that raised money for various charities, and that passion led her to become a mentor for high school students. Through programs like Operation Snowball, chaperoning mission trips, and mentoring high schoolers, Sarah can help others by giving back to the programs that played a very large part in who she is today. That is why Sarah has taken on the position of Volunteer Coordinator with The Ehlers-Danlos Society. She hopes to give back to the organization that provided her with a solid foundation of information and support. Right after her diagnosis in 2009, Sarah met up with seven other Chicago-area EDSers and from that evening, a support group was resurrected. In just seven years, their group grew to an online contingent of nearly 600 members—and the launchpad for the Chicago EDS support group that meets once a month. 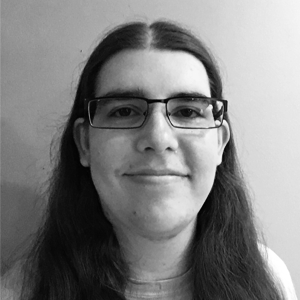 In her free time, Sarah performs with various musical ensembles in her area, has a voracious appetite for reading, enjoys all types of gaming and comics and considers herself a very well-rounded geek.